James Dearmiju (@dearmiju), located at Salon Republic in West Hollywood, CA. was thrilled when new client Adrienne agreed to a lavender/silver blonde colormelt. "This color is ideal for clients that like to change a lot. When hair is this pale it fades with each shampoo so the only way to keep the color is to use a dry shampoo and minimize washing as much as possible." Step 1: First lighten the hair. Apply Goldwell Silklift 20 volume + Olaplex from roots to ends. Step 2: Process for 75 minutes until pale yellow. Rinse and towel dry. Step 4: Quickly apply Formula A to scalp area. Cross check to ensure saturation. Step 5: Apply Formula B to the rest of the hair while leaving out about 6 inches of the ends. Step 6: Take 1 inch horizontal sections and overlay Formula A onto the Mids onto every other sections to blend the root color and mids. Step 7 : Apply formula C to the ends and process for 3-10 minutes depending on porosity. Step 8: Rinse and follow up with Olaplex step 2 and shampoo with a good violet shampoo and condition. "It fades to platinum and some gold and she comes in regularly for retouches," says Dearmiju. "Her bleach retouch formula varies. 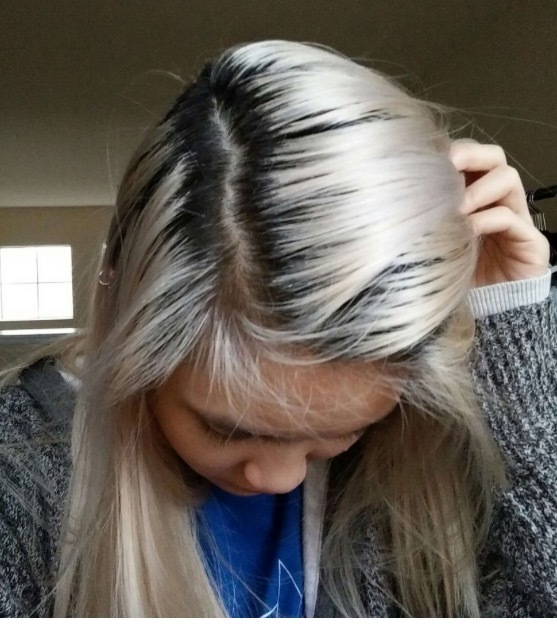 If she is at 4 weeks, I use the 20 vol + olaplex bleach formula above for 75 minutes. If it is more than that I use 10 volume onscalp 1/4 inch, and then 30 volume + olaplex on the rest of her newgrowth for 90-120 minutes checking every 10 minutes or so. I place end papers between each sub section after cross checking to make sure the bleach doesn't bleed onto the weaker and light parts." Dearmiju always covers the hair with plastic wrap or a shower cap during processing. "The toning process varies on a few things. If I am applying alone and know it'll take longer to apply, I'll dilute the formula with developer. Instead of 1 part color to 2 developer, I will do 1 to 2.5. I also do this when a more translucent effect is wanted. With olaplex, we have to shampoo after toning, so I always keep in mind that some of the pigment will shampoo out and appear lighter." For shampoo, Dearmiju advised: "A good violet shampoo that is closer to a bluer violet in pigment will help the hair fade beautifully to silver as the colors fade out. If you neglect using it, hair can fade we with a green cast. Iprefer using oxidative colors for these pastel shades because of the predictability. Non oxidative semi permanent colors are not always easy to remove and can stain hair with random colors when trying to bleach out." And for clients looking for more of a commitment and longevity, "I use a similar formula using Goldwell Ellumen to overlay on top."